A note to readers: This post was honored by BlogHer, the Women’s Publishing Network, with a Voice of the Year award for 2012. I have since retitled it and it will appear as Part One of Have You Met My Daughter? My Mother, Her Alzheimer’s, and Me in an e-book anthology jointly published by BlogHer and Open Road Media. I am working to complete Have You Met My Daughter? and will post forthcoming essays, in serial form, on this blog. A person with dementia (or Alzheimer’s Disease) suffers two deaths. The first death occurs when you discover the illness taking hold, erasing the vivacious mind and the vital spirit of the person you once knew. The second death is when the physical body expires. For these reasons, a bereaved person who loses a loved one—first to dementia, later to death—grieves twice. And although much has been written about mid-lifers—the so-called “sandwich generation“—who are caught between caring for ill or elderly parents while still raising children, perhaps there is room in the literature for one more account. 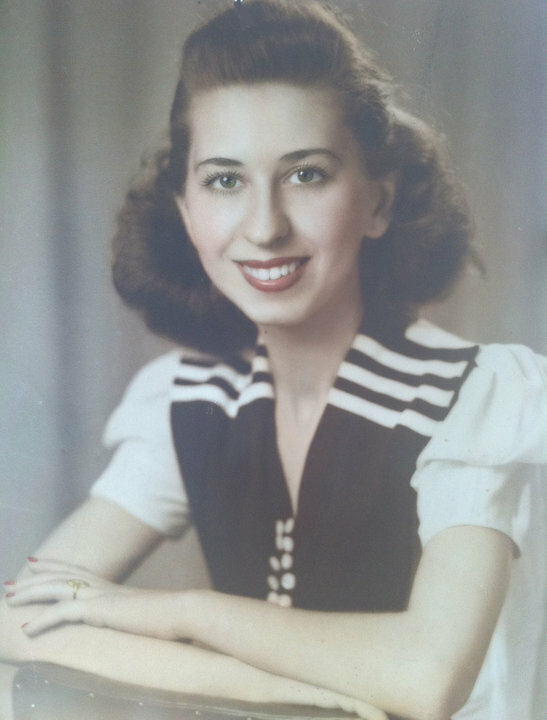 This November, to mark National Alzheimer’s Disease Awareness Month and National Family Caregivers’ Month—and in honor of my mother—I am beginning to write a series of essays about how I loved my mother and how I lost her—not once, but twice. This was the question my mother, who had impeccable manners, regularly posed to co-workers or acquaintances when introducing me to them for the first time. There was, of course, tremendous solace in the fact that despite her illness, my mother did recognize me as her daughter. Nevertheless, it was heartbreaking to see how her memory, her very sense of self, had deteriorated. The signs had been there for a while; it just took time for me to connect the dots. My mother had always been what used to be called “high-strung.” She suffered from panic attacks, and was fearful of many things, including learning how to drive after my father died. She had also always been something of an pack-rat. Today, there is a name for this: compulsive hoarding. But at the time when I was grappling with this issue in terms of my own mother, I did not know it was an illness for which there might be a treatment; I simply put it down to another of my mother’s eccentricities. I would clear out as much of the clutter as she would permit (there remained piles that I was forbidden to touch), and a week or so later, my efforts were obliterated. It was not at all unlike Sisyphus pushing his boulder up the mountain. After several years of this, the hoarding had gotten so out of control that I began to fear for my mother’s safety. I was able to convince her that she needed help; she allowed me to hire a cleaning woman to do her laundry, dust, vacuum the floor, and keep the bathroom and kitchen clean. When I arrived, she pointed to a hole in the dining-room window screen—no more than two inches in diameter. NOTE: The Alzheimer’s Association is not responsible for information or advice provided by others, including information on websites that link to Association sites and on third party sites to which the Association links. Please direct any questions to weblink@alz.org. Thank you, Kathleen. And thank you for reading. I lost my mother to Alzheimer’s, too. Because I am a writer, many people advised me to keep a journal of how I was feeling. I never did. Writing about it would have made it real, and that is something I can hardly grasp today, ten years later. Marci, thank you for having the courage to put your experience out there for all to read. I think no one can understand the tragedy of Alzheimer’s unless they have seen a loved one become a stranger–and a violent one sometimes, at that. All I ask in the way of understanding is that people not make jokes about getting “old-timer’s disease” when they forget to do something. Alzheimers’s is so much more than memory loss. It is a complete loss of one’s personhood and independence, and it comes gradually, “on little cat feet.” You are right; it’s two deaths for the affected person. But in my experience, the grieving begins with the diagnosis and never ends. Oh Debby … I had no idea. It has taken me ten years to be able to write about this. While I was living it, it was too raw, too painful. And yes, too real. I’m so sorry that you and your family had this experience—and I’m very sorry for your loss. It seems we had similar feelings while we were living with our mothers’ illnesses; most Alzheimer’s families probably do. I don’t think I will ever be able to write about my experience, but reading yours–and knowing you–is and always will be a privilege. I am so very sorry for your loss, too. Someday maybe we can talk at greater length. In the meantime, I am looking forward to reading your essays. It’s like Alzheimer’s does the same things to people. My grandmother went through these same things. Including the cleaning lady part. It’s such a hard disease to watch.Congratulations on VOTY! Amazing parallels…I’m sorry you have experience with this heartbreaking disease. Thanks so much for sharing your story with me, and VOTY congrats back to ya! Having lived with this with my father, I can relate. It’s heartbreaking. I felt like I lost my dad, years before he left this earth. Oh Janie…I’m sorry to hear that you, too, are among the many. Thank you for taking the time to share your story.